Mount Olivet Cemetery is an historic cemetery located at 1300 Bladensburg Road, NE in Washington, D.C. It is maintained by the Roman Catholic Archdiocese of Washington. The largest Catholic burial ground in the District of Columbia, it was one of the first in the city to be racially integrated. Chapel at Mount Olivet Cemetery. 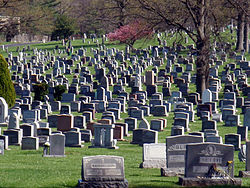 On June 5, 1852, the Council of the City of Washington in the District of Columbia passed a local ordinance that barred the creation of new cemeteries anywhere within Georgetown or the area bounded by Boundary Street (northwest and northeast), 15th Street (east), East Capitol Street, the Anacostia River, the Potomac River, and Rock Creek. Existing Catholic cemeteries at St. Matthew's Church, St. Patrick Catholic Church, and St. Peter Catholic Church were nearly full. A number of new cemeteries were therefore established in the "rural" areas in and around Washington: Columbian Harmony Cemetery in D.C.; Gate of Heaven Cemetery in Silver Spring, Maryland; Glenwood Cemetery in D.C.; and Woodlawn Cemetery in D.C. Father Charles I. White, the 51-year-old priest who had led St. St. Matthew's Roman Catholic Church since 1857, was the individual most responsible for the creation of Mt. Olivet. The cemetery was created in 1858. The Roman Catholic Archdiocese of Baltimore, which then covered the District of Columbia, purchased 40 acres (0.16 km2) of Fenwick Farm for the cemetery. A gray stone lodge was built to mark the entrance. Because the burial grounds at St. Matthew's, St. Patrick, and St. Peter churches were all full by that time, a number of graves were moved to the newly-established Mount Olivet in order to make room at the old cemeteries for new burials. Mount Auburn Cemetery, a rural cemetery near Boston, Massachusetts, was the model for Mount Olivet. During the late 19th and early 20th centuries, Mount Olivet was known as one of the "big five" cemeteries in Washington, D.C.
From the start, Mount Olivet was racially integrated. Most cemeteries in the city were not. More than 7,700 African Americans were buried at Mount Olivet between 1800 and 1919 (about 7.6 percent of all African American burials in the city). In comparison, 24,000 Caucasians were buried there during the same period. Mount Olivet remains the only racially integrated cemetery from the 19th century to remain active as of 1989. Francisco Pizarro Martínez (1787–1840), Mexican ambassador to the United States (1837–1840). One British Commonwealth war grave of a Canadian Army soldier of World War II. ^ a b Totland, Colton. "Washington's Historic Cemeteries: Where the Nation's Past Lives." Washington Times. August 9, 2012. ^ "A Good Priest at Rest." Washington Post. April 2, 1878. ^ "Archbishop to Dedicate Cemetery." Washington Post. June 16, 1956. ^ a b Truett, p. 304. ^ At least one source says the cemetery was created in 1857. See: Richardson, p. 314. ^ Truett, p. 305; Bergheim, p. 280. ^ The others were Congressional Cemetery, Glenwood Cemetery, Oak Hill Cemetery, and Rock Creek Cemetery. See: Richardson, p. 321. ^ Hendrix, Steve (April 12, 2017). "He made 'Buffalo Bill' Cody the world's first reality star". The Washington Post. Retrieved April 13, 2017. ^ "Carter Burial Here". The Evening Star. September 18, 1911. p. 2. Bergheim, Laura. The Washington Historical Atlas: Who Did What, When and Where in the Nation's Capital. Rockville, Md. : Woodbine House, 1992. Johnson, Abby Arthur. "'The Memory of the Community': A Photographic Album of Congressional Cemetery." Washington History. 4:1 (Spring/Summer 1992), pp. 26–45. Rash, Bryson B. Footnote Washington: Tracking the Engaging, Humorous, and Surprising Bypaths of Capital History. McLean, Va.: EPM Publications, 1983. Richardson, Steven J. "The Burial Grounds of Black Washington: 1880–1919." Records of the Columbia Historical Society. 52 (1989), pp. 304–326. Truett, Randle Bond. Washington, D.C.: A Guide to the Nation's Capital. New York: Hastings House, 1942. Wikimedia Commons has media related to Mount Olivet Cemetery (Washington, D.C.). 1858 establishments in Washington, D.C. This page was last edited on 15 December 2018, at 16:33 (UTC).